I would like to receive future offers and promotions from Carphone Warehouse and Currys PC World. There are a few ways you can upload your receipt. You can take a photo of it. Just click Browse, select the camera and take a snap. If you’ve already taken a photo of it, then just click Browse and find your receipt in your photo library. You can also upload your receipt as a file, especially if you’ve shopped online. In this case, your receipt will be called your Invoice. Just click Browse and find it in your files. All you need to do is make a purchase or enter into a contract agreement, and you’re guaranteed a prize. You can shop with us in store, online or by calling our sales team. There’s a few ways you can upload your receipt. Promoter: The Carphone Warehouse Ltd, 1 Portal Way, London, W3 6RS and associated partner Brandmovers. Only one entry per transaction per person per week. A Participant may not enter on behalf of someone else. The Promoter reserves the right to request such information as it considers reasonably necessary or desirable for the purpose of verifying the eligibility or validity of an entry and any prize/gift may be withheld unless and until the Promoter is satisfied with the verification. The promotion is open for qualifying purchases made between 01.11.2017 and midnight on 21.12.2017 (the “Promotion End Date”). Prize redemptions can be made on the promotional website between 01.11.2017 and midnight on 04.01.2018 (the “Redemption End Date”). Entries received after the Redemption End Date will not be accepted by the Promoter. To enter this promotion, Participants are required to spend no less than £4.99 in a single transaction or enter into a fixed term contract agreement from Carphone Warehouse online, instore or via our call centre during the promotional period. Submit the required information on the promotional website, using the transaction ID code found on your till receipt. Please retain your till receipt as proof of purchase. Participant will be required to upload a scan or picture of their till receipt to verify their prize/gift claim. Prizes will be instantly announced but are subject to proof of purchase and approval verification. All claims will be verified within 48hrs. Claims are not valid in respect of products that are returned and for which the participant receives a full refund up to and including 14 January 2018, in which case we will be entitled to disqualify a winner and/or claim back any prize/gift issued. Northern Ireland only: No purchase necessary. For an equal opportunity to receive a prize or gift in our £10million Giveaway, please send your name and email address by post to Carphone Warehouse £10million Giveaway, PO Box 125, Brambleside, Uckfield, East Sussex, TN22 5UZ and we will send you a Unique Reference Code. It is the responsibility of the participant to ensure that all postal entries are received on or before 21.12.2017. Standard postal charges will apply; please ensure your entry is correctly stamped. This code can be used on the website in the same way as purchasing customers. NPN entries via post will be restricted to one postal entry per household per week. Submission of entries will not constitute proof of receipt and no responsibility will be accepted by the Promoter for entries which the Promoter does not receive. The Promoter shall not be liable for any loss or corruption of data in transit. For any promotional queries contact the promotional helpline: Tel: 03300 58 08 58 (Open 9am – 8pm Monday to Friday, 10am – 4pm Saturday and Sunday, from 01.11.2017 until 04.01.2018 excluding bank holidays). Standard geographic call rates apply. Charges for calls from mobiles or outside the UK may vary. 100,000x Single Odeon Cinema ticket valid for 6 months and can be used online and in the box office. Tickets can be used for any 2D screenings on any day at any Odeon Cinema excluding Leicester Square, The Lounge at Whiteleys and BFI IMAX locations. The promotion cannot be used conjunction with any other offer, voucher, or account card offer. All participants who do not win a Tier 1-4 prize/gift will receive a tastecard membership valid for 3 months. To claim your membership, download the tastecard app register your details and your redemption code. Offer limited to one per person per household. Restaurant offer is subject to availability, and the member should consult the individual restaurant pages for full details. Restrictions apply. There are 5 prizes of a Mini Cooper 3-Door Hatch to be won including standard manufacturer’s warranty and delivery. No optional extras included. It is the responsibility of each winner to ensure that they hold a full, valid and current UK driving licence should they intend to operate the vehicle. The prize is non-negotiable, non-transferable and non-refundable. No cash alternative is available. The cars will be supplied taxed and registered in the winner’s name and address. The colour, model and specification of the car may vary, and the Promoter reserves the right to change the colour, model or specification of the car to one of an approximately equivalent value. Each winner is solely responsible for obtaining and maintaining for the period of ownership of the prize all relevant licences, permissions and insurances necessary for the ownership and/or use of the prize (including but not limited to comprehensive car insurance). Each winner may be required to provide their (i) passport or birth certificate, and (ii) certificate of comprehensive car insurance cover to the Promoter prior to or at the time of receipt of the prize. Each winner must comply with all instructions and necessary requirements as may be specified to receive the prize and to transfer ownership of the prize to the winner, including but not limited to, completing any required forms and paperwork. Voucher code may be exchanged for one ticket with a standard seat to view a standard 2D film at any ODEON cinema in the UK and Republic of Ireland except for Leicester Square, The Lounge at Whiteleys and BFI IMAX. Online redemption: To use your ODEON voucher code to book online at odeon.co.uk, odeoncinema.ie, ODEON mobile site and ODEON apps, simply enter the voucher code in the ‘ODEON Promo code box’ which appears on the payment page. Once the booking has been completed you will receive a booking confirmation email. To collect your ticket at the ticket machine you will need to enter the booking reference contained in the booking confirmation email. Box office redemption: To use your ODEON voucher code to purchase your ODEON ticket at the box office print this email including your voucher code and give it this to the cinema box office. Voucher codes cannot be redeemed at ticket machines but tickets can be collected at ticket machines if the ticket is booked online. Not valid for Premier, Club, D-Box or any other premium priced seating. Not valid at 3D, IMAX, ISENSE, Gallery, ODEON Event cinema, ODEON Kids, ODEON Silver Cinema, ODEON Newbies or ODEON Screen Unseen. Not valid for premieres, special events or screenings or events not open to the general public. Voucher code is valid on screenings up to and including the day shown only. Voucher code is for personal use only. Tickets are subject to availability. Normal age restrictions and only relevant standard terms and conditions including ODEON general admission terms. Issuer: ODEON Cinemas Limited, St Albans House, 57-59 Haymarket, London SW1 4QX. The prizes and gifts will be seeded via a timestamp generated randomly by our scripts. When any allocated timestamp is reached, that prize/gift would be unlocked and available to win. If all previously unlocked prizes/gifts have been claimed / won, the next person to play will receive that prize/gift. If there are multiple prizes unlocked and unclaimed, the next person to play will win the prize with the earliest timestamp, i.e. prizes/gifts will be awarded in the order in which they are unlocked. Entrants will be notified online immediately after entry as to what prize or gift they will receive. Winners must then follow the on-screen instructions in order to verify and claim their prize. Prizes will be instantly announced but are subject to proof of purchase verification. All claims will be verified within 48hrs. Claims are not valid in respect of products that are returned before 14 January 2018 inclusive, and for which the participant receives a full refund, in which case we will be entitled to disqualify a winner and/or claim back any prize/gift issued. The winners of the Tier 1 and Tier 2 prizes will be contacted by the phone number they provided by 31 January 2018 to confirm delivery of their prize. 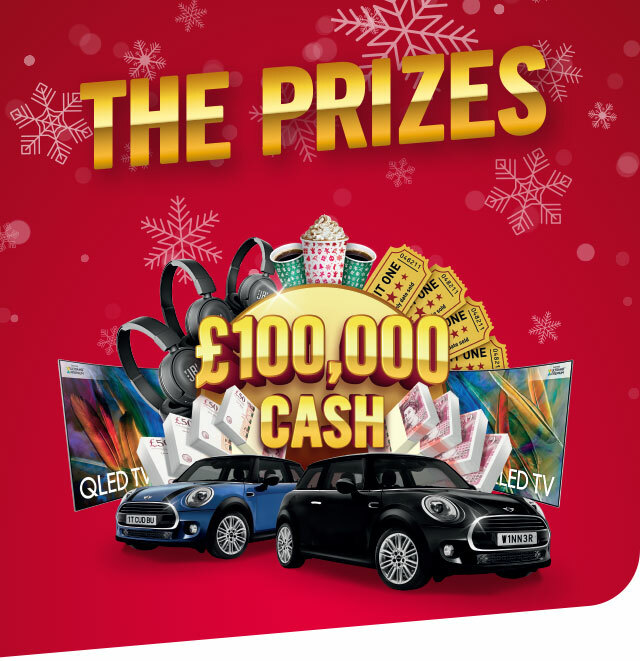 Delivery of these prizes will be to the winner’s home address or via bank transfer no sooner than 15 January 2018. The winners of the Tier 3 prizes will be notified by the email they provided by 31 January 2018. Delivery of these prizes will be by recorded delivery to the winner’s home address within 14 days of contact. Tier 4 and recipients of the tastecard membership will have until 31 January 2018 to claim their gift which will be sent to their email address. The Promoter will not be liable for any prize or gift that does not reach the winner for reasons beyond the Promoter’s reasonable control. If the Promoter does not receive agreement for Tier 1 or Tier 2 prize delivery within 14 days, the prize may be withdrawn. All prize Tier 1, Tier 2 and Tier 3 winners’ details will be passed onto a third party for purposes relating to the administration and delivery of prizes. The Promoter reserves the right to verify all entries including but not limited to asking for address and identity details (which Participants must provide within 14 days) and to refuse to award a prize or withdraw prize entitlement and/or refuse further participation in the promotion and disqualify Participant where there are reasonable grounds to believe there has been a breach of these terms and conditions or any instructions forming part of this promotions entry requirements or otherwise where Participant has gained unfair advantage in participating in the promotion or won using fraudulent means. The Promoter will be the final arbiter in any decisions and no correspondence will be entered into. The Promoter may refuse or disqualify any entry (including winning entries) if the entrant concerned or anyone authorised by the entrant to deal with their entry, acts in a way towards the Promoter which the Promoter reasonably considers to be inappropriate, unlawful or offensive. If the winning entry is disqualified the Promoter reserves the right to award the prize to another entrant. Each winner agrees to participate in any publicity or other such promotional activities which the Promoter may reasonably require in connection with the promotion and the Promoter shall have the right to use each winner’s name, likeness, image, voice and biographical information for advertising and promotional purposes in connection with the promotion in all media without further notice and without the need to make any payment to such a winner. The full name and country of the Tier 1, Tier 2 and Tier 3 prize winners will be available upon written request to the address below. The Promoter reserves the right to change these Terms and Conditions due to circumstances or reasons beyond the Promoter’s reasonable control. Failure by the Promoter to enforce any of its rights at any stage does not constitute a waiver of those rights. This promotion is governed by English law and subject to the exclusive jurisdiction of the English courts. Images for illustrative purposes only. Prizes may differ from the ones shown. Prizes may differ from the ones shown.